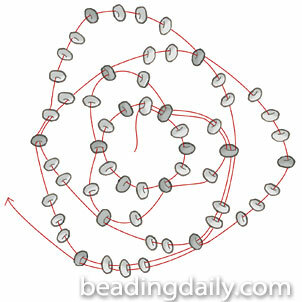 String 1A and 1B six times; pass through them again to form a circle for the foundation round and pass through the next 1B. *String 1A, 1B, and 1A; skip 1B and pass through the following 1B in the previous round. Repeat from * twice, then step up for the next round by passing through the first 2 beads of this round. String 2A,1B, and 2A; skip 1B and pass through the following 1B in the previous round. Repeat twice, then step up for the next round by passing through the first 3 beads of this round. Work each round the same way, increasing the number of A beads as necessary to keep the work flat, and stepping up by passing through the first half of the first net.